Rick Leader's Trait Close Call Question. When I use Tara or Daryl as a leader, the word "Healing charge" or "No Theart" will pop up when I kill walker, It mean it work now. But for Rick as a leader, nothing will pop up even though my target is next to my ally. I summon you from the grave, arise ! I've ran some tests and it seems that the damage is not improved nor the "close call" text pops up. Can anyone confirm that this leader trait is working as intended ? There are a lot of rumors about his trait. I haven’t seen any prof yet that his trait his really working. A lot of people doubt it. Does we need two survivors adjacent to the walker or just one survivor next to the walker will trigger the bonus? Maybe it’s triggered once the walker starts eating. Logic would be on maps with close quarter enemies his trait would be beneficial but only to those that it hits directly next to an ally. So those maps with small rooms the first layer of enemies would get the bonus bit the second layer wouldn’t unless you move an ally directly next to them. Rick’s trait is one of the most disappointing, given his role in the show. If any hero needs a trait rework, it’s Rick. How about this for an alternative trait? Trait properties: The leader traits of any other heroes in the party are active at X% of their original effectiveness. Kills three birds with one stone. First, Rick gets an actually useful trait that is more in line with his role on the show. Second, this solves the ever persistent complaint about Heroes having a wasted trait when they’re not the leader. And third, it encourages players to experiment with different Heroes instead of bringing Sasha and Abe every time. How cool would a Rick/Rosita/Aaron team-up be on maps where you have to kill a tough walker? Or Rick/Rufus/Sasha on some higher level challenge maps? The possibilities are endless. 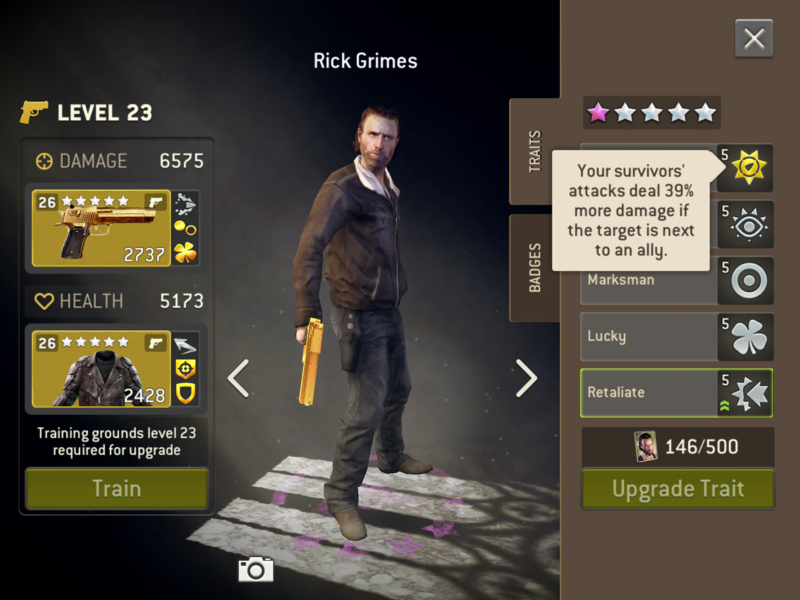 Since the game is moving towards being hero-oriented anyways, we might as well proactively work towards that with a logical rework of Rick’s trait. Just to add my comment onto this because I agree with this 100%. The X% should be 100% of their original effectiveness. This would make Heroes infinitely more valuable/usable and I'd definitely focus on leveling and upgrading them. You might even get me to spend money on Jerry and Eugene (sorry, not really but I would on other heroes). I can imagine a number of Hero combinations I'd love to try together. The obvious ones don't need extensive PRO & CON lists. @JayZ I love it. I’ve been dreaming about a trait like that since “heroes” became a part of this game. @Kaz made my day ! Fantastic answer. The example was great. Thanks a lot! I never understood how his trait worked and you've not only answered but given us an example. This is exactly more of what the community needs. I have to give thanks to @Teezceey for putting you on the forum team. Sorry, but everything in this thread only reinforces my belief that Rick can stay in the barn with so many other “heroes” that I won’t train or go out of my way to get tokens for.